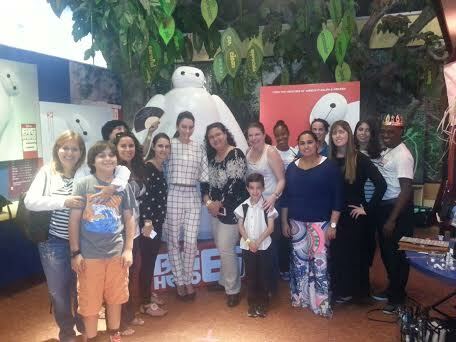 Disclosure: Disney Pictures provided me with admission to a pre-screening for Big Hero 6, as well as the opportunity to attend the round table press day with Genesis Rodriguez. Last week I was invited to the Round Table Press Day for Disney’s latest animated release, Big Hero 6. This particular Press Day was different from others I’ve attended: instead of being hosted at a hotel, we were hosted at the Miami Children’s Museum, and naturally, our kids were invited to the event too! I took Matty with me as I knew he would enjoy it. While the press and bloggers were “working” (I have so much fun at these things, it’s not really work to me), the kids were off exploring the museum and its exhibits. Because I took an extended lunch at work, Matty and I arrived after the other children were on the tour, so he decided to hang out with me and my fellow bloggers in the press room, playing on his DS while we waited. I’m glad he did because he had an opportunity to experience a press junket first-hand, and it was great to see his excitement about the process and about meeting Genesis Rodriguez, voice of Honey Lemon. He was also thrilled to receive a few goodies from the great folks at Disney Pictures. Genesis Rodriguez is a Miami native, and has had several roles in Latin telenovelas as well as American soap opera Days of Our Lives. She has had movie roles in Man on a Ledge, Casa de Mi Padre, What to Expect When You’re Expecting, and The Last Stand as well. Big Hero 6 is her first animated feature. This interview was so fun! Genesis would answer our questions in both English and Spanish, and we got to learn why this movie, and this role in particular, is so close to her heart. 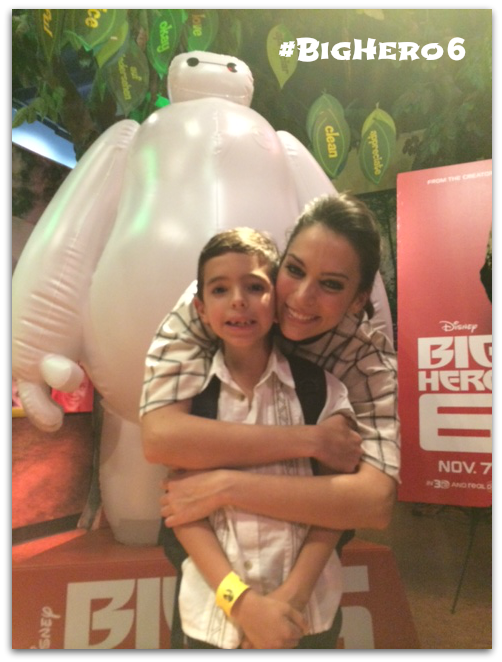 Do you think Big Hero 6 is only for boys? Big Hero 6 is not only for boys, there are two very strong female characters that are even more fearless than the boys. This is the first time you see girls that don’t need saving, they are the first ones ready for action and ready to take on the world. It’s so amazing too that the one important quality being featured in the movie is their brilliance, their intelligence. I hope girls in class will start being the first ones to raise their hands and not be afraid to be the smartest girl, because knowledge is power and it is strength, and that’s beautiful. How did you feel about playing a girl in Science? Was this something you were looking forward to, hoping to open doors for girls? A lot of kids these days say “I want to be famous” and I would love them to add something else to it, like “I want to be a famous scientist” or “I want to be a famous chemist”. Whatever it is, but just change the world. I feel like kids need that hunger and curiosity instilled in them again, that hunger for technology and knowledge. I was in an all girls robotics team in high school, I was a welder, and I was a part of figuring out the pneumatics of the robot: how to make it turn, perform different actions, spins, punch, pick up something. I still have such a love for it, and I hope I can go to high schools and work with kids working on these things. What do you think of Baymax? He’s the most beautiful thing I’ve ever seen! Do you know what it would be like if we had Baymax’s in our lives, with all the health scares, how wonderful would it be for a robot to take care of you and treat you with kindness…it would be such a beautiful thing. What part of yourself do you see in Honey Lemon? Everything! The only difference is maybe she’s two octaves higher than me. She is so happy, I’ve never been so happy for such a long time. I went into the room, acted like a silly person, and went out of the room and I couldn’t believe I was working, that was so much fun. It’s just not fair to get paid for that sort of thing! It is a gift for me to be giving a Disney character to generations. Disney has always been a part of my life, and has shaped my life. It teaches me about everything magical and innocent and about hope and love, all these wonderful themes have been given to me as a child, and to be able to give that back is just amazing. Honey Lemon wasn’t written as Latina, but I was able to put a lot of my personality in there. The way she says “Hiro”, she pronounces it in Spanish, she wants to call him in an endearing way, de carino, and she expresses herself a certain way. I was allowed to put some of myself in there, and that’s the biggest blessing. San Fransokyo, is a hybrid city, and Latinos live in a hybrid state. How do you bridge the two cultures? (Genesis answered in Spanish, I translated the first part, but the second part of her answer is more eloquent in Spanish)Yo soy bilingue y bicultural. I only spoke Spanish at home, and English at school. It’s something in me because my family wanted it to be in me. And it’s something that I don’t see as out of place. I identify with both cultures perfectly, and not one more than the other. It comes from home, from the traditions you want to maintain in your home. Esto me da poder, no me limita. El hecho que tengo las crianzas y las enseñanzas de mi familia es lo que me hace diferente a cualquier otra persona. Al final del día una no deja la morál o lo que le da la familia, eso queda contigo el resto de la vida. Y quizas en este momento no van a apreciar, pero al final del dia si van a apreciar que le distes la oportunidad y la ventaja de otra cultura, es una ventaja. Que tengan los dos idiomas en la casa es un poder. Es un super poder. Which were the most difficult and the most fun scenes to do? The most difficult were the actions scenes because you have to stay still. They say, “you’re falling off a building”, and you’re making all these noises and you don’t know if they sound real or not. That was the hardest. My favorite scene is when the team is trying out the gear for the first time with the butler, and he’s stoic. My favorite with Honey is her introduction, when she comes in rolling with the ball. She’s so kooky! If I were able to have a superpower it would be able to communicate in any language with anyone in the world, and everything, even animals. Thank you, Genesis, for taking the time to speak with us, and for making a certain little boy very happy! Thanks BB! I warned advised him he had to be on his best behavior. I did not, however, instruct him to hide under the table. I think he was completely starstruck!